Boxes, Teddies, Toys and Childhood memories. Jayne from Country Cottage Chic and Michelle at Cowboys and custard have been talking about childhood toys/teddies. I was very lucky and had lots of toys. Lego, sindy's, playmobile, loads of softies a lovely farm yard. Its hard to say my favourite. I was though always very content with an empty card board box and a pile of paper tissues, or even better a tissue box with half its contents left in it. You might ask what I found so fascinating about boxes and tissues. Well I liked to make houses for everyone of my treasured animals, being softies or little ornaments they all had houses. Decorated with fine swags made from tissues. Beds so soft and comfy made from cotton wool and yes more tissues. This might of been some thing to do with the effects of being an only child for 10 years and having to amuse ones self. I lived in this imaginary world of my animals and houses and when I was not making I was drawing or painting. That was until one certain Friday night in March some twenty one years ago. It very annoyingly nearly interfered with the weekly viewing of Gardner's world that I had always been allowed to stay up and watch on a Friday night with my mum. Luckily we just got to watch it. The teddy I would like to share with you is Mixer. He came in a huge box, which of course I liked very much, but inside was this funny old mouse creature. My Grandma had given him on the Saturday the day after my little had been born and the box filled my lap as I sat in the back of the car on the way to visit the new brother in hospital. I named the mouse Mixer named after the dog in this book. I used to love this book. I loved the colours. The way it was written as a play which you could act out with the pull tabs (I was a slow reader as I'm dyslexic - if you had not guessed! I might of enjoyed reading something in this format). 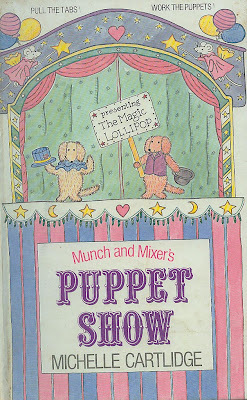 I loved the story about ever lasting lollipops and it all finished with Munch and Mixer holding an everlasting lollipop party under the everlasting lollipop tree, with all their animal friends. The colour of Mixer mouse rather reminded me of Mixer Dog, so I think that had something to do with the naming too. Mixer and I have been on many adventures together, he came on all my school residential and much to my dismay got swung round by his tail by my friends. I'm sure I made him houses out of cardboard boxes. 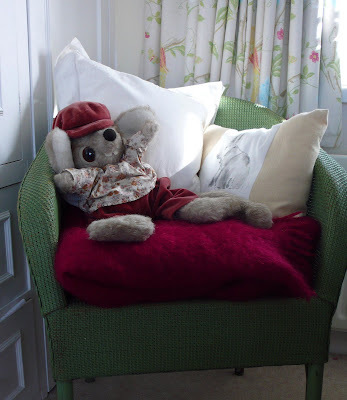 I have other more precious softies/ teddies, it must have something to do with the manner and circumstances in which he arrived, has made me have a certain affinity with him. He is one of a few softies that have made it to our little house from my parents in Suffolk, more will follow but they don't like travelling together as they get a little argumentative in the car. Oh and I still made houses from boxes after my brother was born. He was a my naughty little brother and I had built a multi story sky scrapper (lots of boxes stacked up) of a house with a ground floor shop stocked with an assortment of use full things including real loose tea and split peas. Along the naughty little brother came and knocked it all over, well that was the end of that sadly the hay day of the card board box house was over. My further attempts got more dolls house like, smaller and just different, one even had electric lights fitted and a rather nice upholstered three piece suite that I had made from some empty sardine boxes. Deliveries, printing, paint and Captain Rupert goes to the pub! While Captain Rupert enjoys the frosty mornings and the warmth of the late morning sun, I have been busy battling with cello wrappers packing up orders for cards all the orders are of to some lovely garden centres and farm shops. Every now and then I glanced over to the end of my desk and get tantalizing by glimpse's of the painting at the end of my desk. 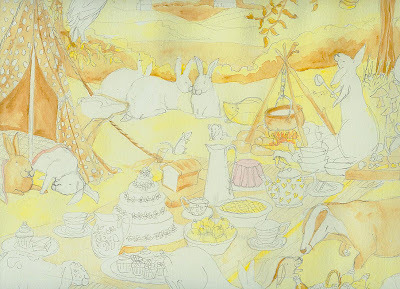 The painting had been drawn out for ages onto the lovely creamy water colour paper and I have not been able to wait to start with the first stage of laying up the paint. I find some times that when every thing is busy its hard to know where to start first, but its great when things finally begin to get ticked of the to do list. Captain Rupert has been enjoying a hectic social live going out for tea yesterday afternoon. Well actually he was a model in a children's art lesson I had been teaching. He gets paid in carrots! We then both met K and his Friend in a local pub I don't normally go to the pub and let K have a boys night out every week or so. Captain Rupert was very excited about going to a pub and did not want to miss out to be left in the car as he had been never been to a pub before. He enjoyed chatting up the girl behind the bar, but turned his nose up at beer and crisps so luckily he came prepared with his own box of of good old hay. We are so pleased that everyone liked his stamp so much, Captain Rupert is very chuffed with it too. Yesterday we received a delivery of very smart stickers all bearing his stamp and are looking forward to putting them proudly on all the envelopes and packages we send out. And maybe the invitations to his next party. 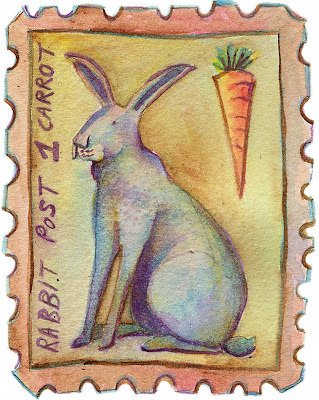 Yesterday too, I went to see the latest batch of cards roll of the printing press Captain Rupert stayed in the garden as its far too noisy for bunnies ears. The cards are printed on a wonderful old press that is controlled by hand rather than a computer this why I can get more adjustment on the colours so they are just the way I want them. Captain Rupert is very glad his Tea Party painting made it as a card design, I do worry that his head will get too big for his paws one day. I can't wait to pick them up from the printers We will show you all next week when they are back from the printers all folded. Yet another delivery saw the arrival of some smart looking cardboard boxes. I had been wanting to change the packaging on the note cards for some time. These boxes are more eco friendly and I love the look. 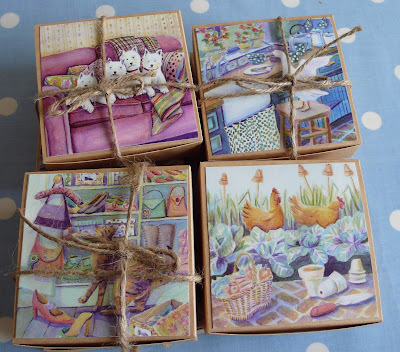 I have put some in our etsy shop. I'm also planning on adding a few more originals and captain Rupert and I have been thinking about some other goodies to add soon to the shop. Captain Rupert and I have been home alone all weekend, and are very much looking forward to K getting back late tonight. 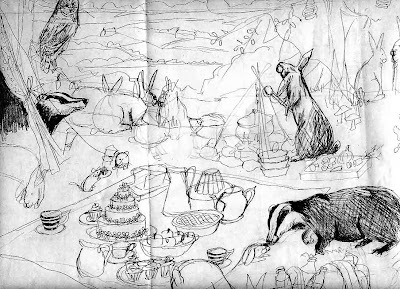 In his absense we thought it only right to have a party, we invited all of captain ruperts friends, including badger and barn owl and ernest the mouse, we are still waiting for some of his rabbit friends to arrive, I'm sure they will they will sniff out what a wonderful spread we have laid out on the picnic cloth. We picked the spot carefully, the view is great and it catches the evening sun. The slope levels of making plenty of room for all the guests. 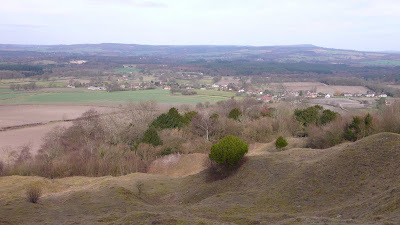 It not to long a walk from our house, infact you can see our house, its in the cluster of red houses towards the left. Just over the trees. When the light fades there are plenty of lanterns and the birds have promised to sing, so there is sure to be some dancing and much merryment. Great aunt Velvet fashioned a tent out of an old table cloth so if it gets chilly there is some shelter and there is some warming carrot stew being prepared. I think I might do a tonal study of this drawing before painting it, I don't normally because of the way I layer up the colours normally resolves any tonal issues, but there is so much going on and its a big picture ( A3) I think it might make me feel more confident in painting it. I went to visit the horse with one eye on my walk on the Down yesterday, she is so friendly. 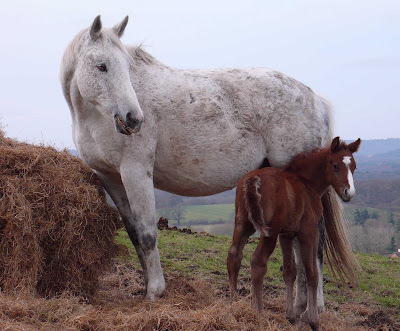 I was delighted to see she had had a foal, which was so exciting. I thought they look lovely together. 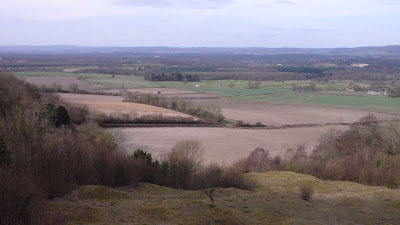 I can just see the field that they live in from my bedroom window, the horses look like dots. Now I know, I can spot her and her foal as a white and brown dot eating lots of hay. I will have to visit again soon.